Last night I wanted something to snack on. And was feeling specifically for crunchy cheese sticks. So somewhere close to midnight I was mixing up a dough with Gloucester cheese, mustard and cracked black pepper. Fortunately, some sanity came to me, and I only baked a few. Saved the rest in the fridge to bake tonight for my Australia vs Ireland snacking tomorrow. And to take pictures. And so I thought to myself, I could blog the recipe. I will have to make it again to document the process, but at least there is the finished product to look at! And if I wait, then I won’t have a blog post, and I figured out that regular blogging makes for regular readers (hehehe) These are Late Night Cheese Sticks not just because I made this batch late at night, but that’s pretty much when I spent lots of time developing various baked cheese snacks. 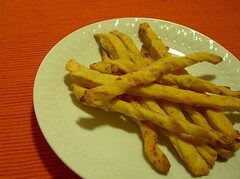 From cheese scones, to cheese and pimento pepper rolls to various attempts at cheese straws or sticks. So, voilà. 2. Add mustard and shortening and rub into the flour until mixture resembles fine breadcrumbs. 3. Add shredded cheese and rub into mixture. 4. Add the water slowly, mixing until mixture forms a dough that’s not sticky. Separate into 2 or 3 sections to work with. 6. Cut into thin strips to your liking (about 1 cm wide) and lay on a greased baking sheet. You can twist the strips to form a corkscrew or leave them straight. 7. Bake in a preheated 375 degree oven for 10-15 minutes, or until golden brown.Depending on your oven, you may need to bake longer for a crunchier stick – test them to get them to your liking. Store in airtight container or bag. 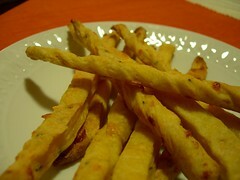 Serve with salsa, or your favourite dip, or eat them hot and crispy all by themselves. Feel free to add more cheese. This recipe makes enough to fill 2.5 1-quart bags. About 5 or 6 dozen sticks 10 cm x 1 cm. They were eaten before I thought to really count them. Mix the dough as per the recipe, and roll out one-third of the dough to 1/2 cm thick. Sprinkle a handful of shredded Parmesan all over the top of the dough, then fold the dough carefully over and over (at least 5 times) until you have a small brick. Repeat for the remaining portions of the dough. Wrap each portion in waxed paper, place them inside a resealable plastic bag and refrigerate for a couple hours or overnight. Preheat oven to 375 deg F. Spray/grease baking sheets. Use one brick at a time, leave the others in the fridge to stay firm and cool. On a lightly floured surface, press or roll out a brick to a rectangle, with the short side about 6 cm, to about 1 cm thick. Using your big sharp chef’s knife, in one smooth rocking motion, carefully slice the brick into 1/4-1/2 cm thin strips (almost like a julienne). The dough should be firm enough after the refrigeration to allow easy handling this way – and it is much easier than rolling out flat and cutting into strips. Place the strips on the baking sheet, with 1cm space between them and bake for about 15 minutes till golden (brown on the bottom) and crunchy. As you can see the textures are a bit different – the layers with the cheese make for a lovely flavoured and extra crunchy cheese stick, with a double burst of cheese. And the little brown bubbles of baked cheese are beautiful and delicious. This entry was written by Chennette and posted on April 13, 2007 at 12:16 am and filed under Chennette, food, recipes. Bookmark the permalink. Follow any comments here with the RSS feed for this post. Post a comment or leave a trackback: Trackback URL. when you come nah – but I give you the recipe, you could make for ME!! How much would I love to be your neighbour?? Poor Irish are going to get their behinds trashed by the Auzzies…but you gotta love the Irish fans, always there to have a good time. Thanks for the recipe, am adding it to my collection. Chennette, I second cranky, I want to be your neighbour. Will you bring me chicken soup and thing when I’m sick? By the way Cranky, I agree that Ireland will get thrashed today by Australia. Last time I looked at the TV it was 24-4…..sad. Are your cheese sticks the same as Cheese straws? – Nice pic by the way. i made them! they are awesome. i ran out of plain flour so i used half white half wholemeal selfraising flour, and added some carraway seeds. i hope these make them healthier because it’s all i’ve been eating today! oh YAY – that’s great 😀 I usually add a tonne of stuff into these like chives and chadon-beni/culantro, but those seeds sound good. did you make for me? do i show up on your roll bb? However, I show up as an anonymous stranger on my own blog. Must be the cookies. Soon, Soon, I will. I promise. It’s all this going to cricket and work. Distractions. Want to know what you mean by vegetable Shortening? Is it butter?? Want to try this recipe soon please advice…..
Hi V – Vegetable shortening is what we call Cookeen in Trinidad (or in the UK) and Crisco in the US. You could use butter or margarine, the texture would be a little different but as long as it was cold it will be an ok substitute. Shortening is the white stuff used for pastry.